The biggest events in Napa in May 2019 include BottleRock, Calistoga Food & Wine, and special wine tasting activities at the wineries. You will also find some great shows throughout the month at the Blue Note. In addition, I've included some great deals on tastings around Napa Valley as well as a few places to find the best rates on local hotels. You're invited to watch the fastest two minutes in horse racing on the big screens in our Barrel Cellar. Start with a refreshing Sauvignon Blanc Mint Julep follow by scrumptious, Kentucky inspired nibbles paired with our winning wines including our 2018 Rose. Wear your best hat, tie, or both to participate in our "Best Derby Attire" contests! Enjoy live Blue Grass music on our Garden Terrace and surprises throughout the afternoon! Tickets are $50 for the general public and $40 for club members. Contact them directly at 707-227-3255 for tickets. This three-day long celebration of food and wine kicks off on Friday with the Winemaker Dinner at the Fairwinds Estate wine cave, offering a perfectly paired meal in a fantastic setting. 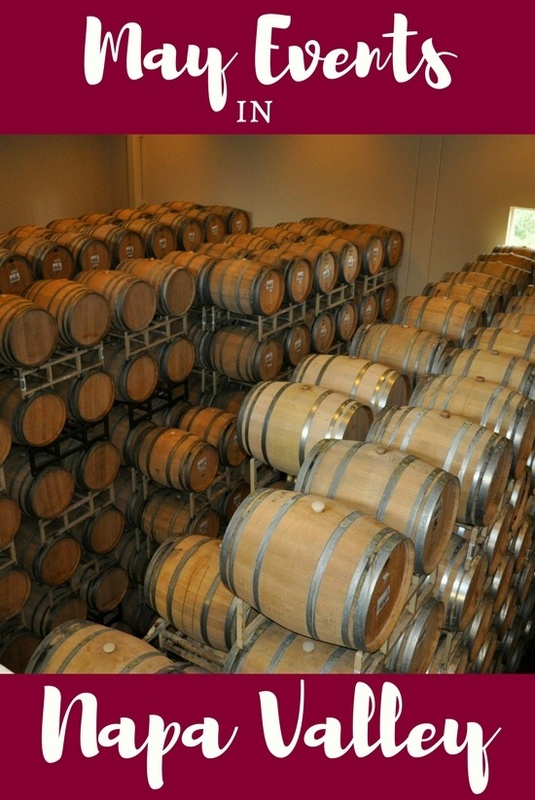 Saturday afternoon is the Grand Tasting Event at Solage Calistoga with delicious samples from over 40 local wineries. Finally, the event concludes with the Chef and Sommelier Brunch, combining freshly made gourmet creations with breakfast cocktails. Of all the events in Napa in May, the BottleRock music festival is probably the most anticipated. This three-day celebration of great music, food, beer, and wine attracts lots of big name artists. Friday headliners include Imagine Dragons, Logic, OneRepublic, and Sylvan Esso. Saturday brings Neil Young, Pharrell Williams, Nathaniel Rateliff & The Night Sweats, and Gary Clark Jr. to the stage. And finally, Sunday welcomes Mumford & Sons, Santana, Tash Sultana, and Lord Huron. This lineup is truly hard to beat. The following events are held at wineries all around Napa Valley. Many are open to the public and most have discounted rates or are complimentary for wine club members. Most events in Napa in May land on the weekend, but there are a handful during the week too. These events are VERY popular, so I recommend planning in advance if you can and booking your tickets before you arrive. Spend the weekend at the Napa County Fairgrounds with food, fun and entertainment. The Flynn Creek Circus will perform both days with high flying acrobats. Head over to the speedway to watch AMA racing and watch the bull studded Mexican Jaripeo. You can also enjoy goodies from local food trucks, chef demonstrations, community competitions, a petting zoo, kid's activities, and so much more. The doors are open from noon to 10pm both days. Are you looking for some fun nightlife events in Napa in May? Check out these popular shows coming up this month at the Uptown Theatre. This is the second year for Inspire Napa Valley. It's a weekend long event with wine tasting, dinners, a VIP brunch and more. The proceeds from this event will go to support the Alzheimer's Association. The event starts with a VIP dinner on Friday night. On Saturday, there is a seminar, wine tasting event, and a seated dinner. The event wraps up with a VIP brunch on Sunday morning. Here are a few great wine tasting deals in Napa Valley on Groupon. Check out the Blue Note for some of the best nightlife events in Napa in May. This jazz clubs bring live music to the stage most nights of the week. It's one of my favorites as it's set on the first floor of the history Napa Valley Opera House. Their dinners are also amazing and used with locally grown ingredients. The best part is that they pair it all with top of the line Napa Valley wines. Are you looking to stay for a night or two as you enjoy these events in Napa in May? If so, check out these great hotel deals all around the valley. You will also find some great shows this month at JaM Cellars Ballroom in downtown Napa at 1030 Main St. They are located in the same building as the Blue Note inside the Napa Valley Opera House.